A tasty makeover for a classic French dish! During the hottest part of the summer, we eat composed salads quite often for dinner. With the right ingredients, they can take little time to prepare and be both nutritious and satisfying. 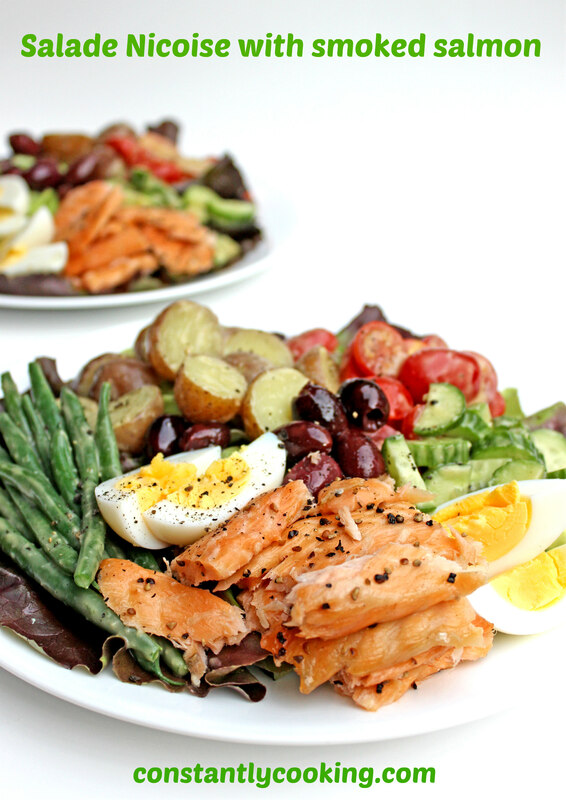 I’m a huge fan of the classic Salade Niçoise which typically features either anchovies or cooked tuna as its main protein, but just for fun I made it with smoked salmon and it was a huge hit! Look for thicker smoked salmon strips if you can find them as they have a different texture and flavour than the thinly sliced varieties you may be more familiar with (although those would be tasty too). I enjoy preparing the potatoes, beans and hardboiled eggs early in the day; the beans and potatoes can be kept, covered, at room temperature while the eggs must be refrigerated. You can also make the vinaigrette ahead of time and re-whisk or re-blend it just before serving. With this work done, it takes just moments to assemble and serve this delicious meal. Pair it with a crisp white wine and some crusty bread. Put potatoes and 1 teaspoon (5 mL) of kosher salt in a medium saucepan and just barely cover them with cold water. Bring to a boil then reduce heat slightly and cook for 8 – 10 minutes, until just tender when pierced with the tip of a knife. Drain and place in a single layer on a plate, sprinkle with white wine then let cool. Prepare a bowl of ice water beside the stove. Bring a fresh medium-sized pot of cold water to a boil. Add green beans and cook for 2 minutes, until barely tender. Drain and immediately put beans into the ice water. Once cooled, dry well with a kitchen towel. Place the eggs in the same saucepan and cover with cold water. Cover pot and bring to a boil over medium-high heat, then remove from the heat and let stand 10 minutes. Drain, then immediately run eggs under cold water to cool. Peel under cold running water and refrigerate. Make the vinaigrette by whisking together the vinegar, water, shallot, mustard, thyme, 1/2 teaspoon salt, pepper to taste and Worcestershire sauce in a small bowl with high sides. Whisk in the olive oil in a slow, steady stream until emulsified. You can also use an immersion (stick) blender if you prefer. Cover and store at room temperature until using. When ready to serve, put the potatoes, beans, cucumbers and tomatoes in a medium sized bowl. Drizzle three-quarters of the dressing over top and toss gently to coat. Divide the lettuce between two plates. Arrange the dressed vegetables over top. Quarter the hard boiled eggs and add to the plates, along with the smoked salmon and olives. Drizzle remaining dressing over top and add a bit of freshly ground pepper. 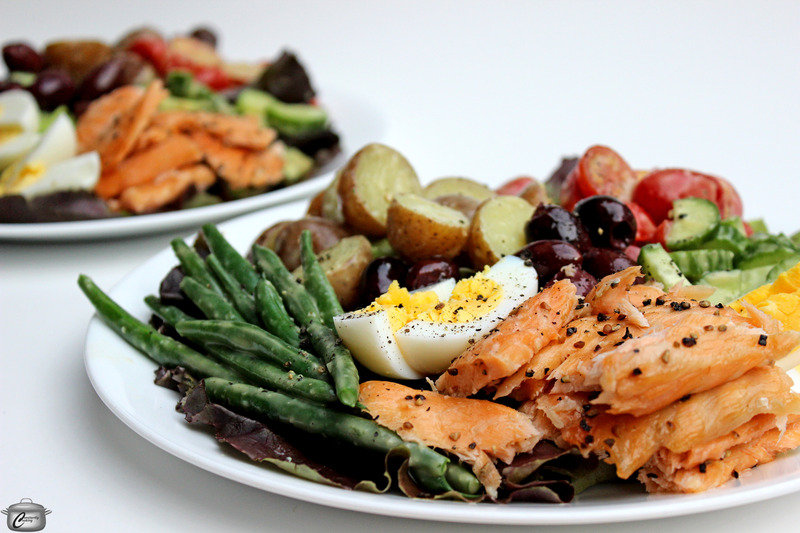 This entry was posted in dinner, fish, Salads and tagged composed salad, fish, hardboiled eggs, make ahead, nicoise salad, Paula Roy, salad, salad for dinner, salad nicoise, salade nicoise, smoked salmon, summer, vegetables, what to eat when it't hot out, white wine vinaigrette. Bookmark the permalink. I love Salade Niçoise too! Never tried it with salmon but I will. Last time I made it, Inadded your vinegar chickpeas. There wasn’t one left! Great idea to add in the chickpeas! I’m going to try that!